That’s the question baseball fans across the country will ask themselves in the wake of several long-standing “curses” falling by the wayside in the last few years. First, in 2004, the “Curse of the Bambino” went down as joyous Red Sox fans celebrated a title for the first time in 86 years as the Old Towne Team (as they were known many years ago) swept St. Louis to win the World Series. Next year, Chicago’s Southside team, the White Sox, swept Houston to claim their first title since 1917, a mere 88 years since they last claimed the throne. Finally came last year; when the heavens shook and the seas parted as the dreaded “Billy Goat Curse” came to an end as the loveable Cubs ended 108 years of misery when they took a thrilling seven "games" series last October. So, like I said earlier, who’s next? Well, the obvious choice is to look at the team the Cubs beat in that truly Fall Classic. Cleveland’s Indians played as well as a team could without closing the deal. After all, they lead three games to one, with the deciding games in their home park, but failed to win it. So it begs the question, are they next? On paper it would seem so. Most of the core team returns, with additions of pitchers Carlos Carrasco and Danny Salazar, so they are clearly the class of the American League Central Division. Funny thing about the next “sure thing” however – it rarely turns out that way. Unlike football, which is a 16-game sprint spread out over 17 weeks, a baseball season is a 162 game marathon played out over half a year. So while the favorites on paper may hold the early advantage, there’s no telling how an injury or a young prospect’s breakout year can affect the fortunes of a dozen squads. Still, if form holds, the Indians figure to be the favorite to repeat for the pennant. Over in the National League, the Cubs and Nationals, with the Dodgers and Giants possibly squeezing in, figure to fight it out for the crown. But, again, what seems obvious in March can be long forgotten by October. My Picks? Read ‘em and weep, and as they say, all information is to be used for entertainment purposes only. NATIONAL LEAGUE: Division champs: West, Dodgers; Central, Cubs; East, Nationals. Wild Cards: Cardinals and Giants. AMERICAN LEAGUE: Division champs: West, Rangers; Central, Indians; East, Red Sox. Wild Cards: Yankees and Blue Jays. 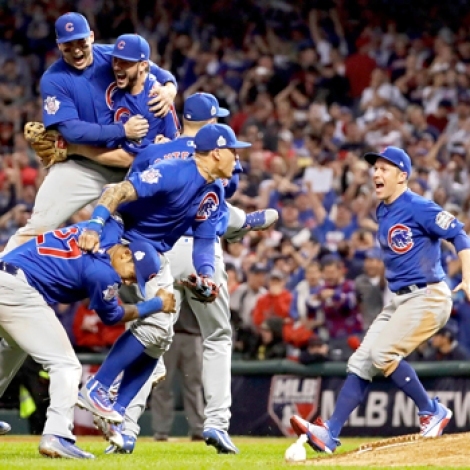 World Series Champion: Cubs, who make it twice as nice. Those are my picks, so who you got? Every day is NEWComebacks? It's What Love About SportsModern Medicine is Big Winner for Injured AthletesJeremy LinWhat is a Reverse Loan?